Thirty-three former circus lions are feeling the African sun on their backs and grass under their feet after a lifetime of misery and abuse in traveling circuses in Peru and Colombia. 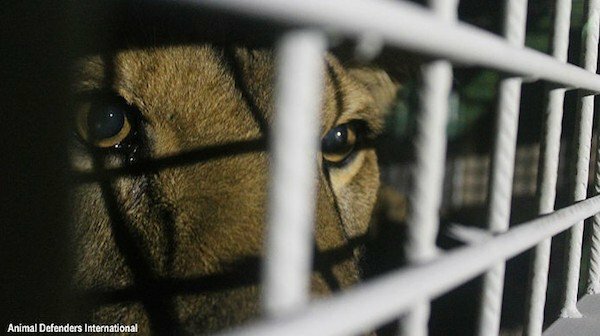 The lions made the incredible journey back to their birthplace after a herculean rescue effort by Animal Defenders International (ADI). Tim Phillips, Animal Defenders International co-founder, said rescuers faced incredible challenges in tracking down and rescuing the lions from illegal circuses in Peru and Colombia. Circus animals are banned in the countries, but many traveling circuses operate in remote areas and moved underground after the laws went into effect. ADI teams worked with government authorities to find and seize the animals. Many times they were accompanied by SWAT teams and riot police in order to secure and rescue the animals. They then had to transport the lions back from remote areas in the Andes and back to their rescue centres. It was an effort that took 18 months to accomplish! 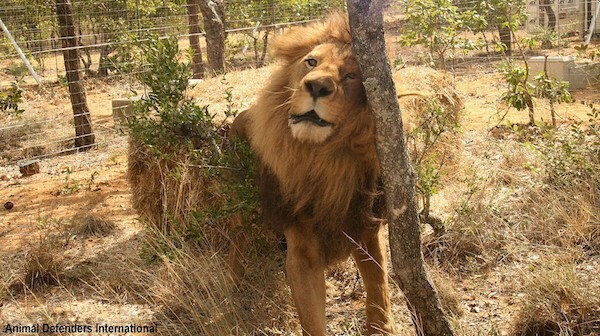 Of the 100 animals saved, 33 were lions. These majestic big cats have endured a lifetime of suffering, confined to tiny cages, maltreated and mutilated. Arrangements were made to fly them back to their land of origin – Africa! Sadly, the lions will never be able to survive on their own because of their physical condition. Many have had their claws removed and their teeth smashed. “They can’t go back to the wild but they can go back home,” Tim said in an interview. The lions will live out the rest of their days in peace and freedom at Emoya Big Cat Sanctuary in Vaalwater, South Africa. “African sun, African night skies, African bush and sounds, clouds, summer thunderstorms, large enclosures in a natural setting where they can remember who they are,” Savannah Heuser, founder of Emoya Big Cat Sanctuary, said in a statement. Tim said bringing the battered, old lions back to Africa is one of his proudest moments. Wait until you hear the lions roaring behind him at 2:56 in the video below. It’s as if they know they are back home! Here is another news video of this amazing rescue operation with the lions taking their first steps outside at their new home. Please share this incredible rescue with your family and friends!